Cold soups are refreshing in hot weather. When people think of cold soups, they usually visualize a bowl of vichyssoise or tomato gazpacho. If you’re looking for something energizing but a little out of the norm, I have just the thing. Students Will Kinney and Mallory Barnes from the Columbia Area Career Center culinary program organized a fundraiser dinner a few months ago before competing in a national contest. One of their courses was an adaptation of a strawberry gazpacho from Eleven Madison Park, and it was awesome. Strawberries have come and gone, but watermelon season is in full swing and pairs nicely with a few other key items that are still in season. This simple soup dances between sweet and savory. It is easy to make; use in-season, high-quality produce available at the farmers market or picked fresh from your own garden. Three main ingredients shine: tomatoes, cucumbers and watermelon, of course. You can make gazpacho the day before to save time. 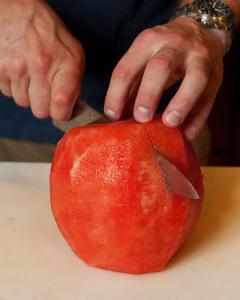 Removing the rind from watermelon is very similar to the procedure used for winter squash. Cut off the top and bottom of the watermelon, then cut about a quarter inch into the rind from the top to the bottom, following the crescent motion of the rind. You can use a spoon to scoop out the baby seeds that form. Honestly, this time of year you can find heirloom tomatoes that are sweeter than most watermelons. 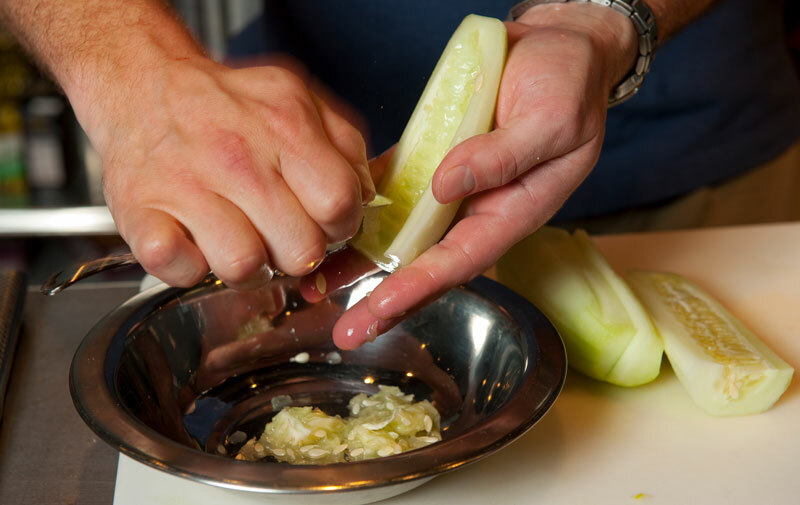 The flesh is the only part that we need to use in the soup; the skin and the seeds just get in the way. To prepare the tomatoes, first boil some water in a pot. Remove the tomato stem and cut a small X on the opposite end. 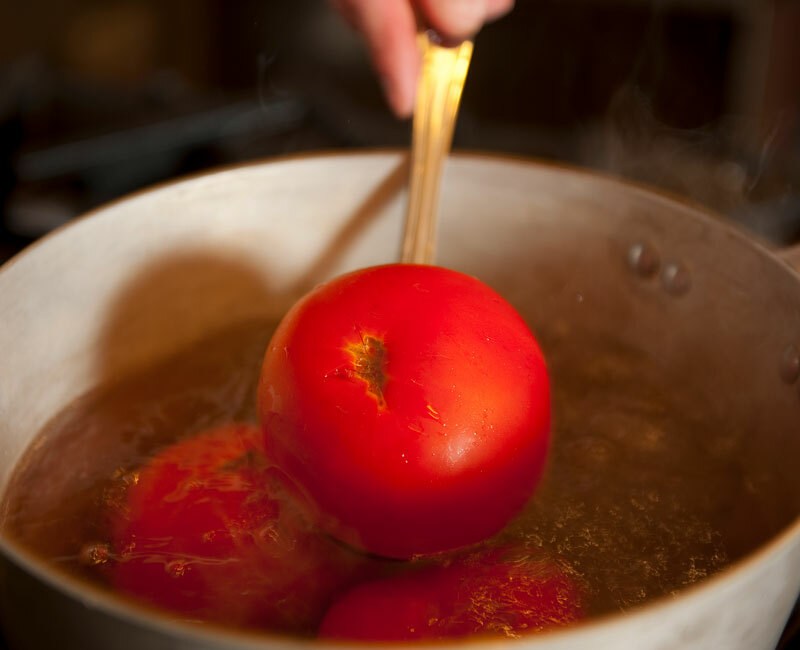 With a container of ice water close at hand, plunge the tomatoes into boiling water. 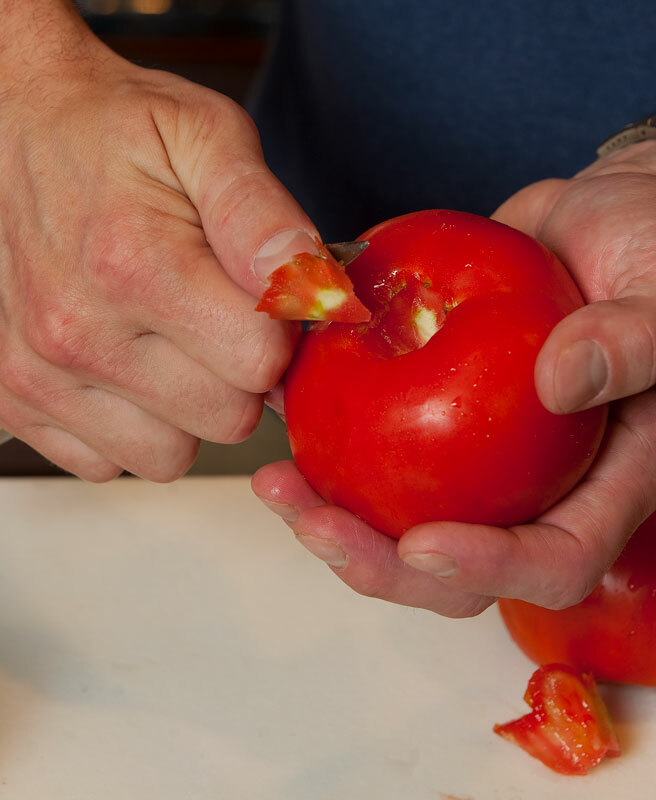 Remove with a slotted spoon after 30 to 45 seconds in the water and test by gently running your finger across the tomato skin to see if it has loosened. 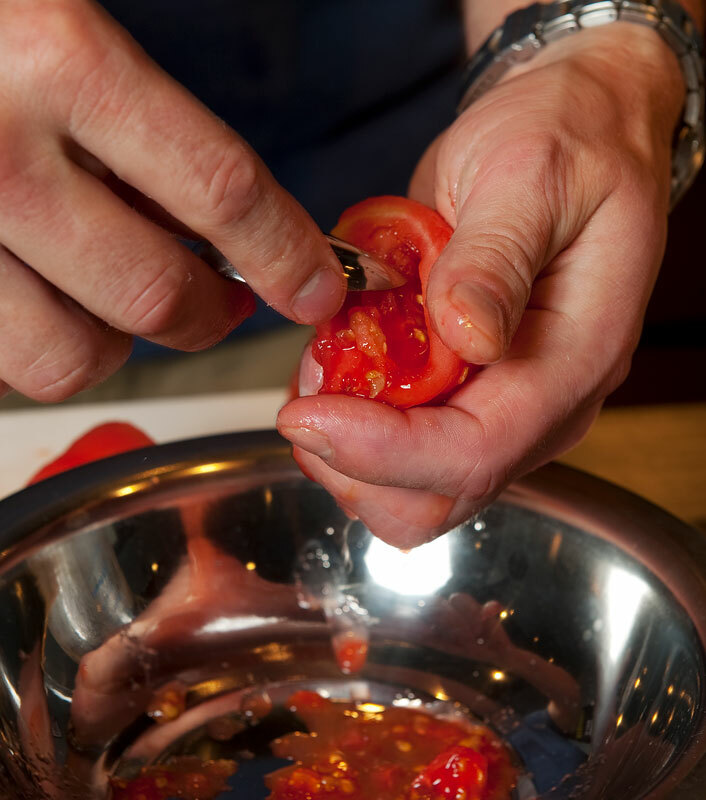 If the test skin pulls back, remove the tomatoes from the boiling water and place them into the ice bath for 2 to 3 minutes. Make sure the tomatoes cool thoroughly before you handle them. 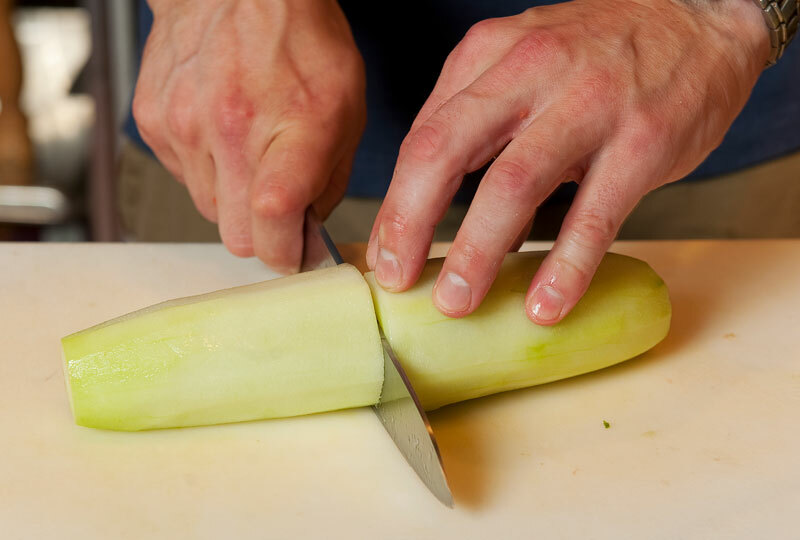 The skin should peel off easily with your fingers. Cut the tomato into quarter wedges from the tip and squeeze out the seeds. 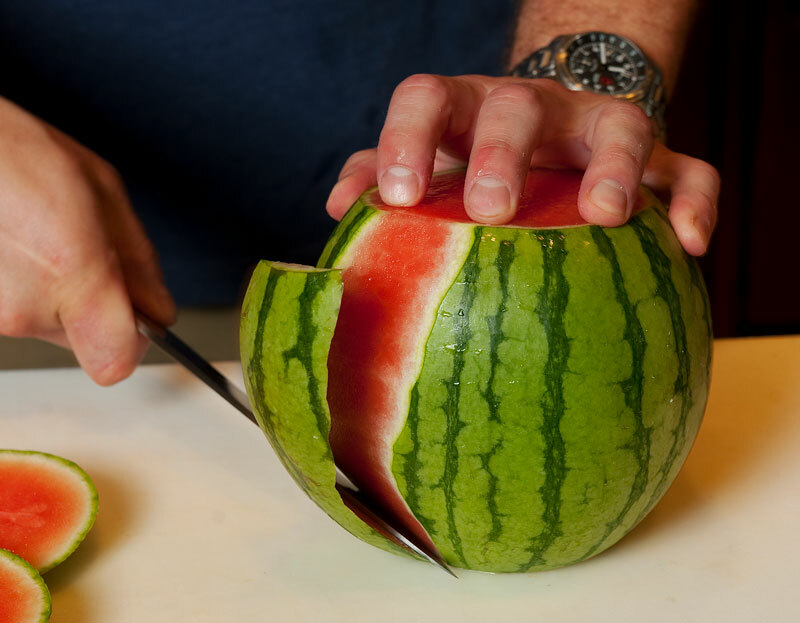 Squeeze excess juice, strain and save. 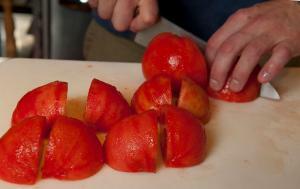 This is also a great way to prepare tomatoes for canning and freezing, or for tomato sauce. 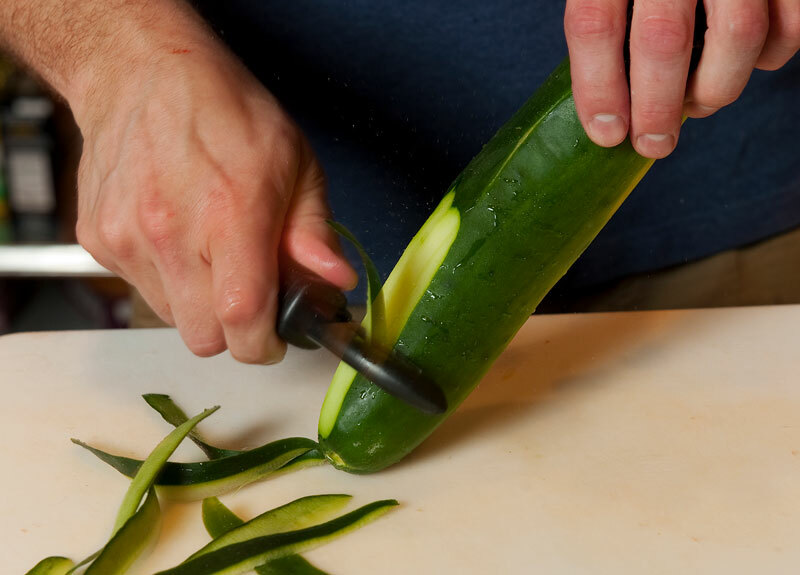 Cucumbers are members of the squash family, although they have more moisture content than other squash and are closer to melons in flavor. Many people prefer to remove cucumber skin and seeds for a more consistent texture and taste. Peel the cucumber, then cut in half and slice lengthwise. Use a spoon to remove the seeds, then rough chop or dice as desired. 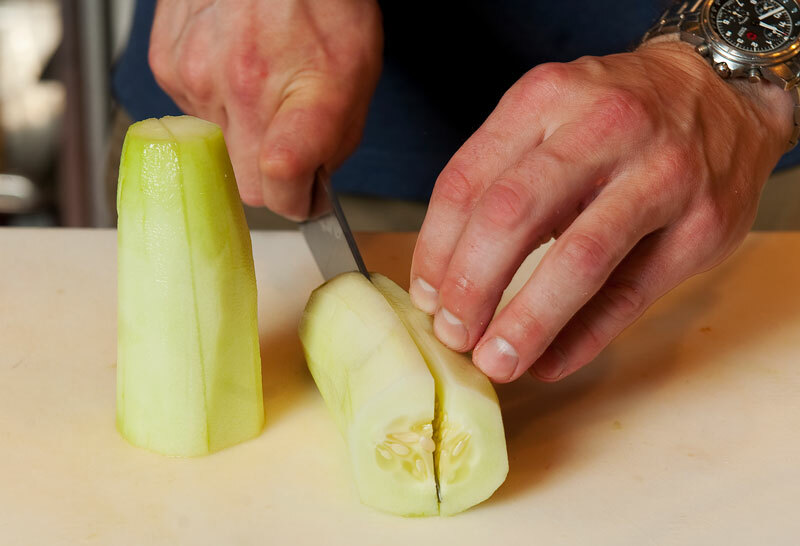 The granité (grah-nee-tay) is a little something extra for the dish and takes less than 5 minutes of preparation time. You can make it a few days beforehand and kept it in the freezer until needed. A granité is a frozen dish used as an intermezzo or as a component of another dish. 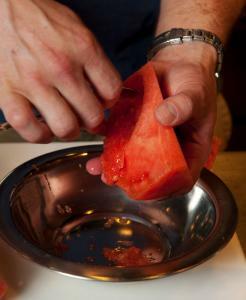 It differs from a sorbet because it is granular in texture — not smooth. 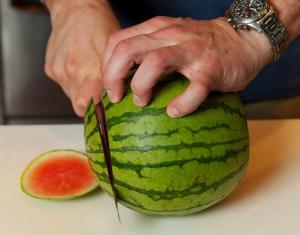 Make all appropriate cuts to your watermelon, tomatoes and cucumbers. 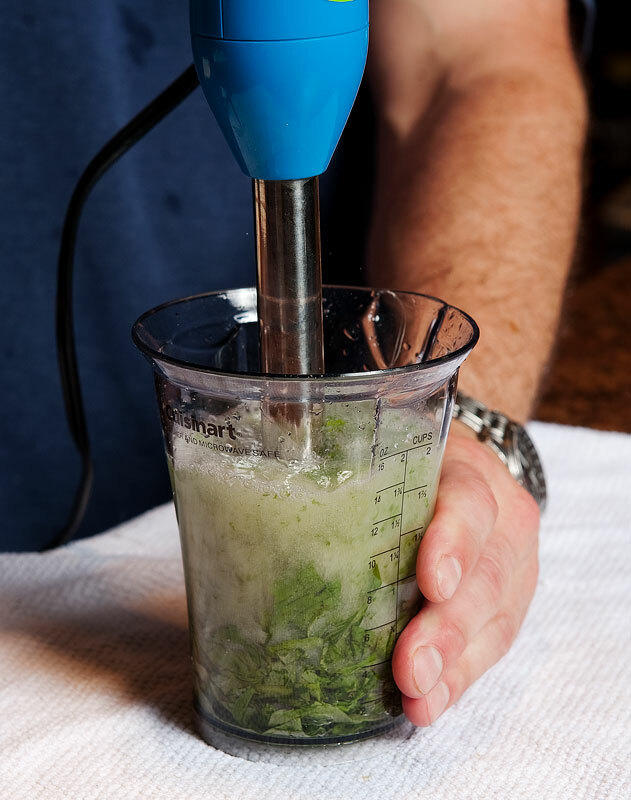 Place into a large container and blend with a hand blender (or you may blend in increments with a stand blender). Blend until mixture has become extremely smooth. Season to taste with salt and sugar. Allow the soup to cool in the refrigerator for 1 to 2 hours until cold. 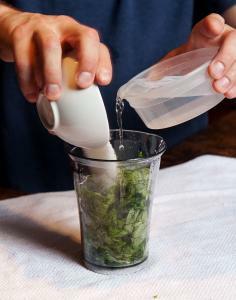 Garnish with basil granité. 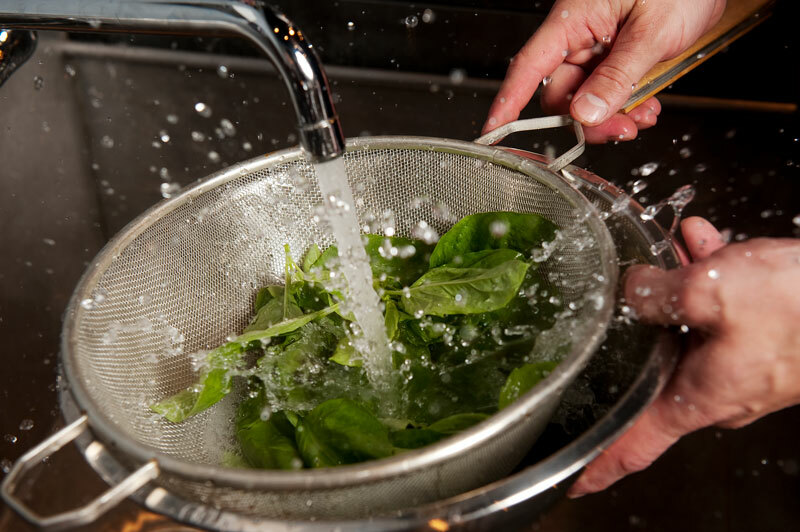 Place basil leaves into a strainer and run extremely hot water over leaves for 30 to 45 seconds until they are noticeably fragrant. Place the leaves in ice water to cool for 30 seconds. Remove the basil from ice water and place onto a towel. Roll towel around leaves while placing a little pressure on the leaves to dry. 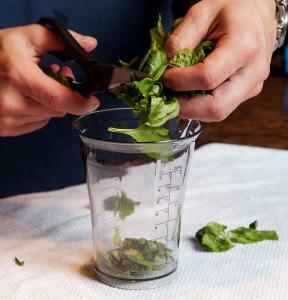 Place basil and all other ingredients in a blender or food processor and blend until smooth. 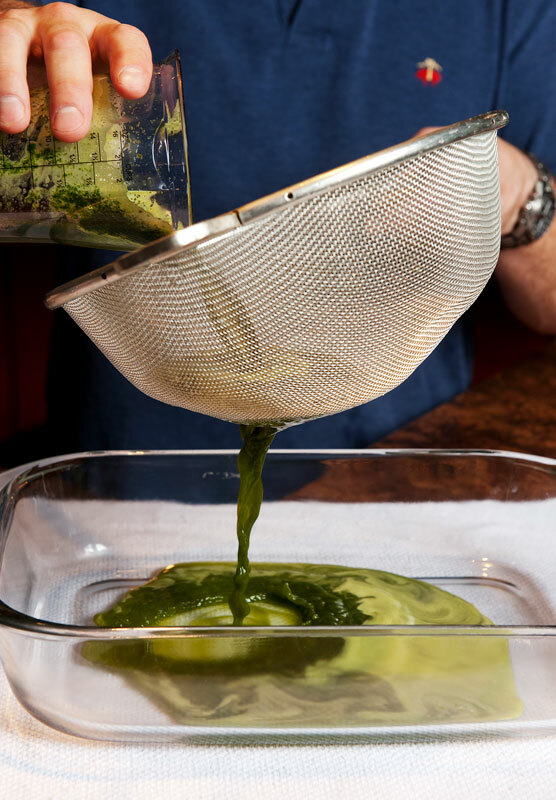 Strain into a casserole pan, or other large pan, and place in the freezer for at least 45 minutes to an hour; it can remain in the freezer for up to 48 hours (the shallower the depth of the liquid the faster it will freeze). Once the gazpacho has chilled, remove the basil granité from the freezer and scrape with a fork. Spoon granité on top of the chilled gazpacho and serve. Gazpacho is best served as cold as possible, especially if it is sweltering outside. I recommend putting the gazpacho into the freezer for about 30 minutes before serving, but don’t let it sit too long or you will be serving two granités.